Guy Fieri rocks. Guy Fieri grew up in Humboldt County, California. He started his food career at age ten selling pretzels at local community events from a three-wheeled bicycle cartnamed “The Awesome Pretzel,” built with his father. Guy Fieri (born January 22, 1968) is an American restaurateur, author, television personality, and game show host. He co-owns five restaurants in California and is widely known for his television series on the Food Network. By mid-2010, the Food Network had made Fieri the “face of the network.” In 2010, the New York Times reported that Fieri brought an “element of rowdy, mass-market culture to American food television,” and that his “prime-time shows attract more straight male viewers than any others on the network. AND FOR FREE SAUCE FRIDAY, WE WILL HAVE 3 WINNERS FOR THIS SAUCE !! 1 GRAND PRIZE WINNER: will receive a sampler pack of all four of Guy Fieri’s sauces. 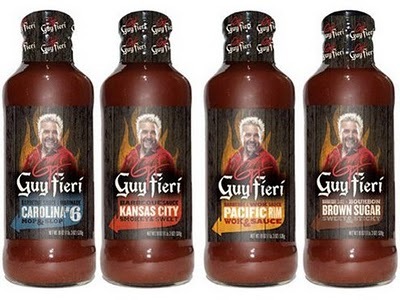 2 ADDITIONAL WINNERS: will receive your choice 1 of 4 Guy Fieri’s sauces. TO WIN, JUST ENTER A COMMENT ABOUT GUY FIERI TO WIN! Contest Starts Friday 6/10 and Ends Monday 6/13 2pm EST! This looks like some good bbq sauce. Gonna buy some even if I don’t win some! I’d love to try your BBQ Sauce. It sounds Yummy! I love to watch Guy host Minute to Win It!! And would LOVE to try this sauce!!! I’m looking forward to trying these sauces. I can’t imagine Guy would put his name on a lame sauce. He is pretty creative and passionate about food so I would think these may be good. Since it’s just the three of you, I’ll be emailing you with details of how to claim your prize. Thanks and see you all next week, we’ve got a LOT of sauce to giveaway this summer.